As one of my friends recently observed, the only conservative thing about me is my palate. I have a timid tongue, so exotic cuisine that I actually enjoy is a rare treasure. But now my favourite Thai restaurant has gone missing, and I am bereft. Only recently - thanks to friends at the Official Opposition - did I discover the savoury delights of Boun Thai, formerly located just south of Jasper Avenue on 107 street. John Santos wisely suggested the cashew chicken, spicy beef and lemon pork chop. I loved all three, but I think I could live happily on the cashew chicken nigh unto eternity. My second-last experience at Boun Thai was on March 10 - a late birthday celebration. Sylvia, my parents and Sean seemed to love it as much as I did. But when I returned for lunch just a couple of weeks before the election, I overheard a waitress explaining that the restaurant would be moving soon. She didn't know where. 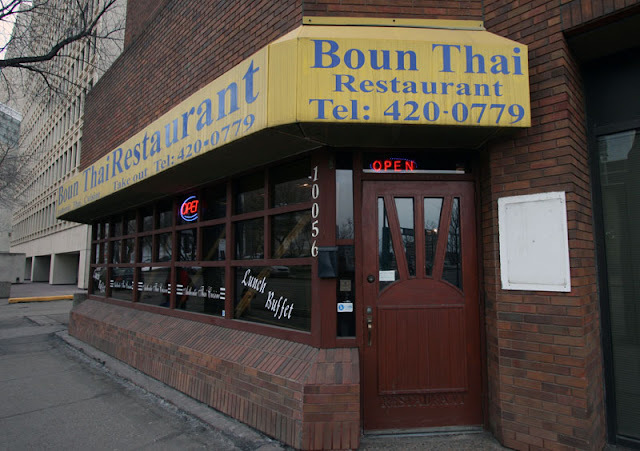 Well, Boun Thai is gone now, and my Google-fu has proven inadequate to track it down. I even phoned, but the number yields only "this customer has not activated their voice mail" messages. I am desperate to feast on cashew chicken once more. If anyone knows the whereabouts of Boun Thai, please deposit clues in the comments. I would contend that the loss of key clientele (i.e. most of the Liberal Caucus staff) is probably what spurred their re-location. The Mighty Brian Leadbetter was the one who first suggested Buon Thai and then dared to dream by opting out of he buffet. He was also the first to order the Sizzling Pan-Fried Beef. I was the first to order the Cashew Chicken and the Lemongrass Pork Chop, and Earl was the first to develop the ingenious strategy of ordering satays different from what were being served at the buffet. Perhaps the most glorious lunch was when Earl and I introduced (most of) the Liberal Caucus Research Department to Buon Thai (Kyle, Karin, Stephanie, and Tyler; Avril was unable to join us that day) and we ordered some seven different dishes during the lunch hour.